The art of the West's introduction to the world came in the 1970s, when paintings and photos from the late nineteenth and early twentieth centuries suddenly became highly sought after in the marketplace. By now, this kind of emblematic Western work — stunning landscapes, charming scenes of cowboys and Indians — has solidified the region's worth in the hierarchy of world art. But there's been something in the wind carrying the idea that the culture quotient in the American West is due for an upward reevaluation. Through February 19, MCA Denver, 1485 Delgany Street, 303-298-7554, www.mcadenver.org. Efforts in this campaign have been undertaken by a critical mass of disconnected individuals from Colorado to California — scholars, historians, critics, theorists, artists, curators, donors and others — who have approached the topic from many angles. In Southern California, for instance, museums, galleries and art centers have coordinated exhibits under the guidance of the Getty Museum to highlight work done in greater Los Angeles from the mid- to late twentieth century. This blockbuster series of shows, collectively called Pacific Standard Time, successfully makes the claim that L.A.'s visual culture was never inferior to the New York scene — as has been taken on faith for over half a century — but was simply a worthy alternative to it. Such a strong claim is bound to incite controversy, but I was struck when these shows in Southern California provided an unlikely opportunity for star art critic David Hickey to insult Denver. "It's corny," he said in the New York Times. "It's the kind of thing Denver would do. They would do Mountain Standard Time." This quote has gotten a lot of mileage, but it brings up two issues. First, one of the big problems with Denver is that the major institutions here don't really promote the local scene, so it really isn't like something we'd do at all. Second, Hickey's wife, Libby Lumpkin, mounted her own version of Mountain Standard Time at the Harwood Museum in Taos last spring called New Mexorado. The show generated hardly a ripple, however, in comparison to the commotion that Pacific Standard Time produced — something that makes me question Hickey's motives. Though not part of an ambitious series of events like Pacific Standard Time, our own MCA Denver is participating in the same zeitgeist anyway, with West of Center: Art and the Counterculture Experiment in America, 1965-1977. The show, organized by director Adam Lerner and his wife and co-curator, Elissa Auther, sprawls throughout all three levels of the museum. 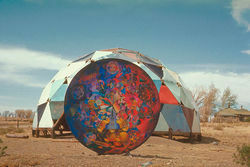 Lerner and Auther also co-edited a scholarly catalogue on counterculture in the West, the scope of which is far greater than that of the exhibit.